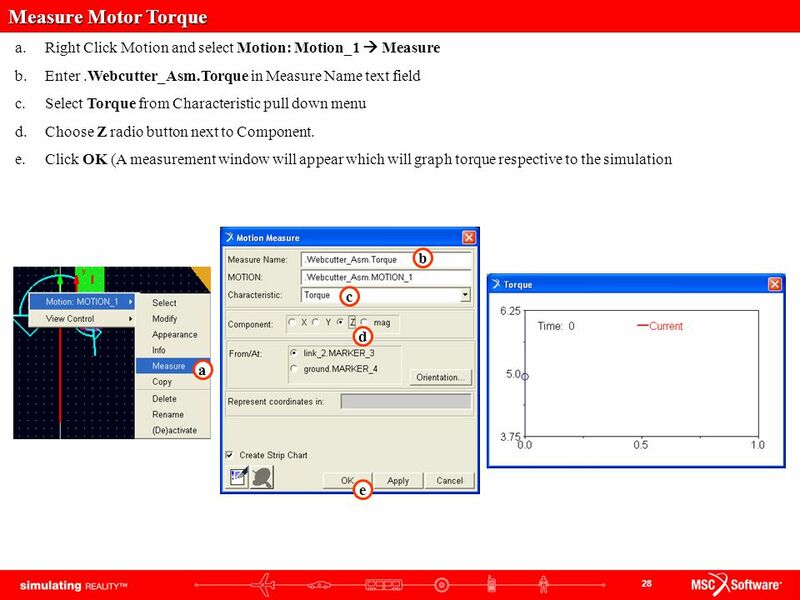 3 Problem Title B4 B3 A2 O4 O2 This tutorial will describe in depth how to use ADAMS to determine the torque of the motor, bearing forces, and the angular position, velocity, and acceleration of the links for the given problem. 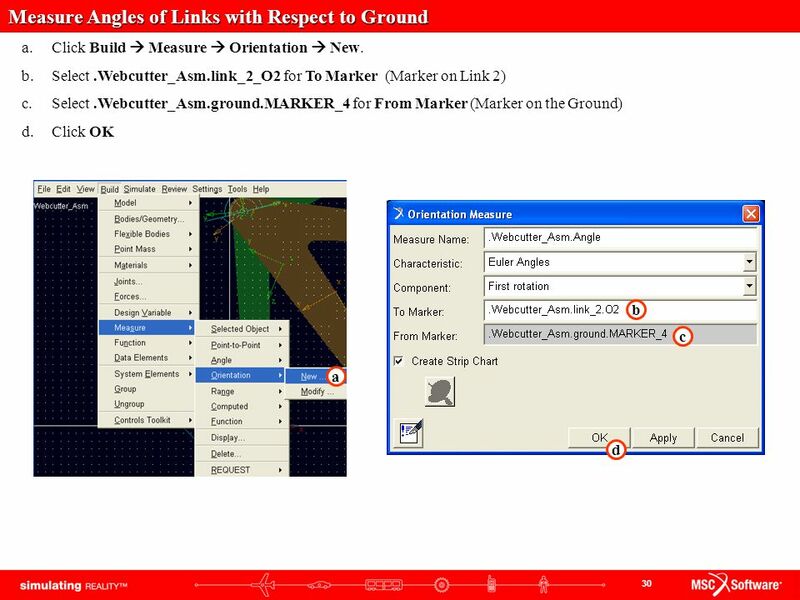 Links are 2cm thick and made out of Al Link 2 is rotating at a rate of 60 rpm CCW. 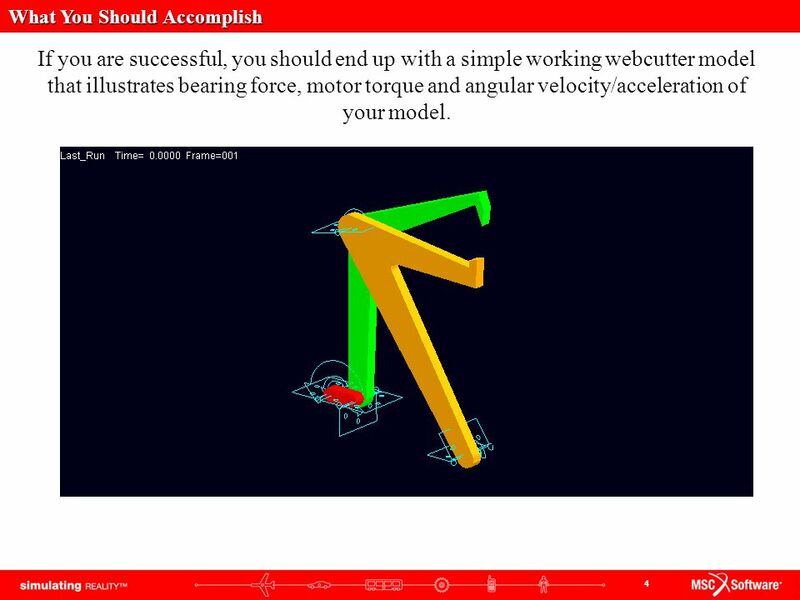 If you are successful, you should end up with a simple working webcutter model that illustrates bearing force, motor torque and angular velocity/acceleration of your model. 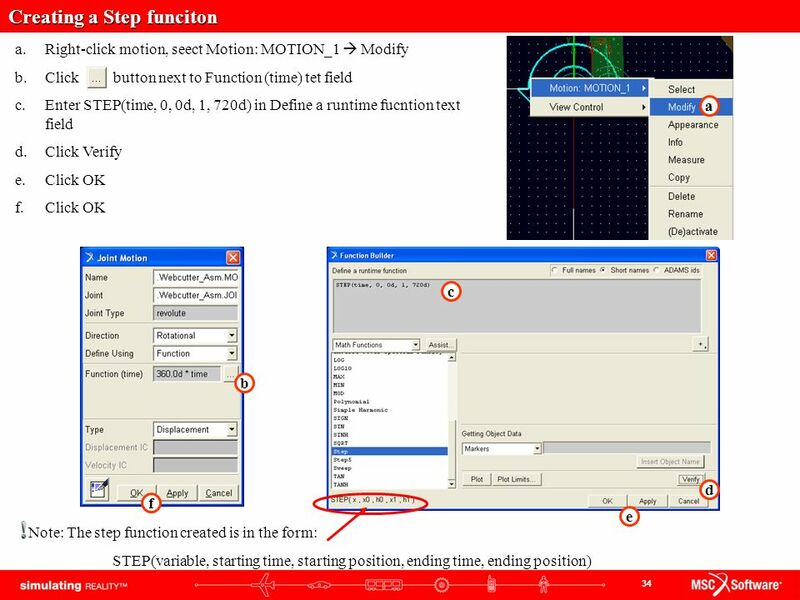 Right-click on the triangle, select Extrusion: Extrusion_1  Modify. 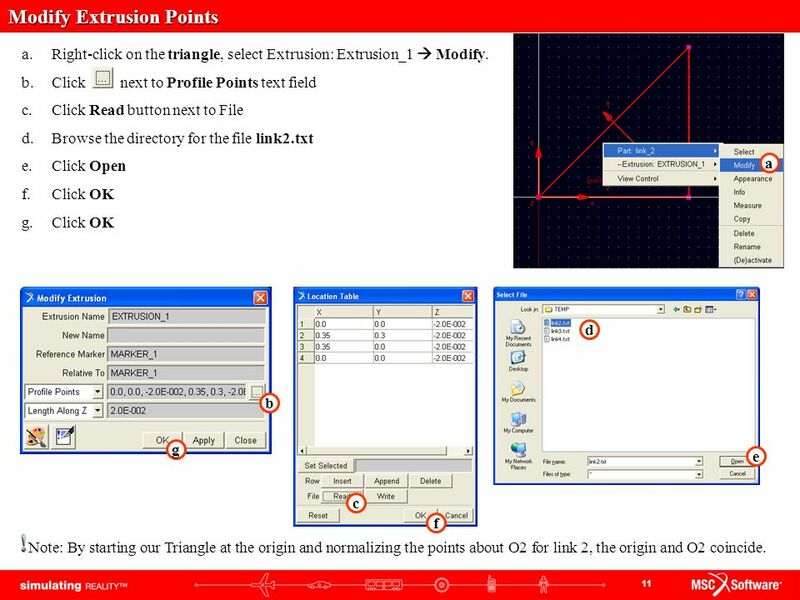 Click next to Profile Points text field Click Read button next to File Browse the directory for the file link2.txt Click Open Click OK a d b g e c f Note: By starting our Triangle at the origin and normalizing the points about O2 for link 2, the origin and O2 coincide. 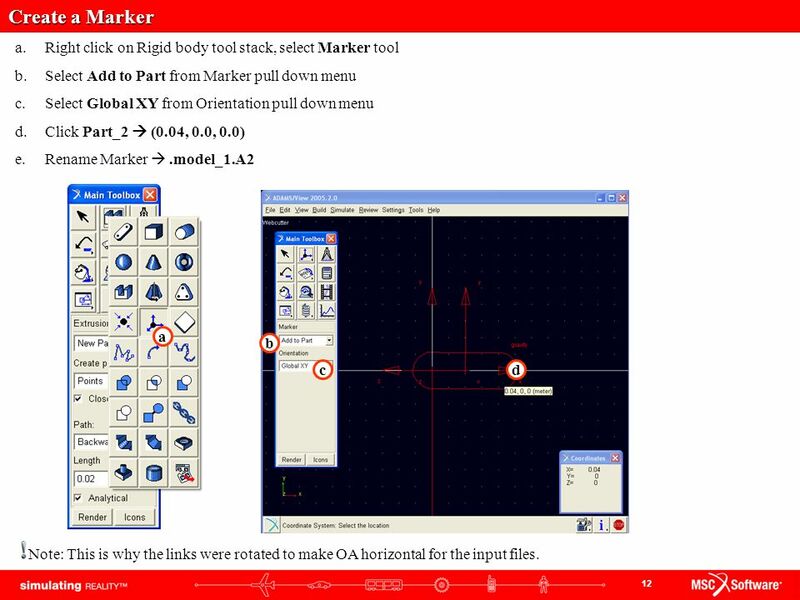 12 Create a Marker Right click on Rigid body tool stack, select Marker tool Select Add to Part from Marker pull down menu Select Global XY from Orientation pull down menu Click Part_2  (0.04, 0.0, 0.0) Rename Marker  .model_1.A2 a b c d Note: This is why the links were rotated to make OA horizontal for the input files. 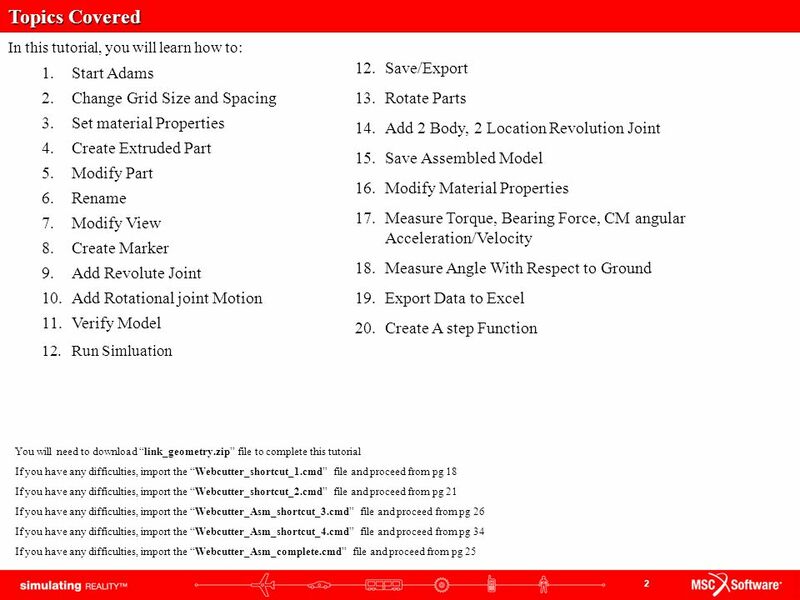 15 Verify Your Model a. 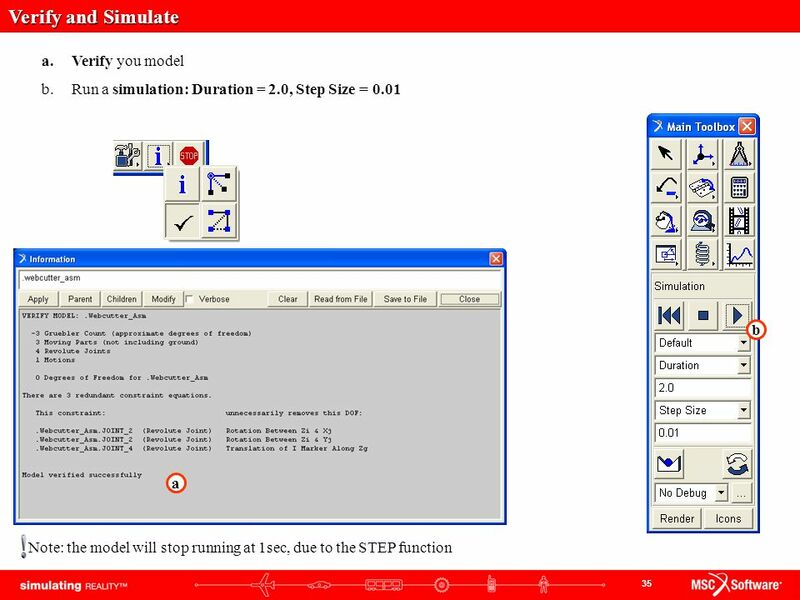 In the lower right corner of the modeling window, right-click on the Information icon. 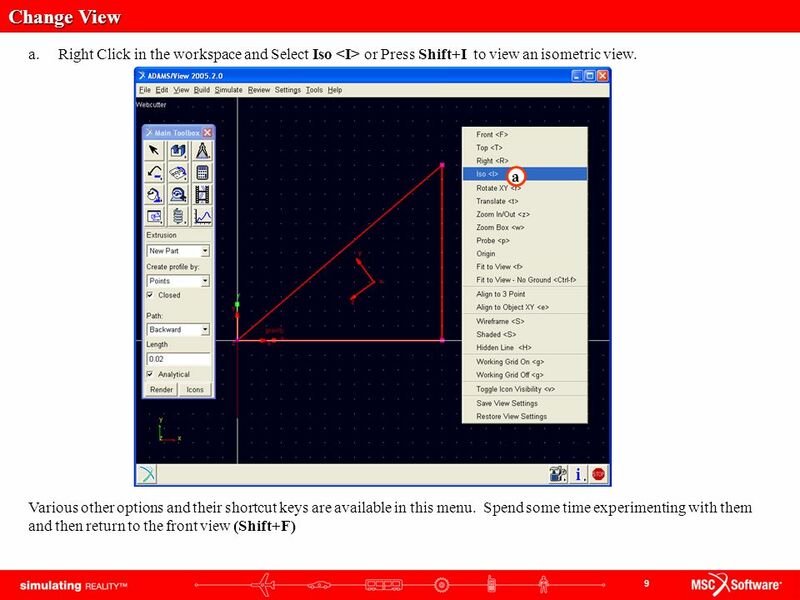 b.	Click on the Verification icon. 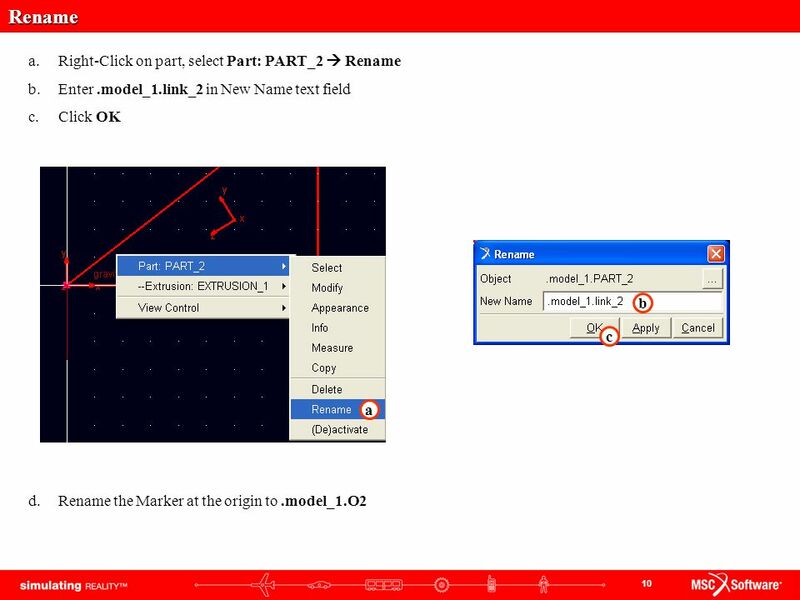 a b The Info Window appears c.	After seeing that the model has verified successfully, d.	click on the Close button d c Note: The model verification step is one way to find errors in the model definition. 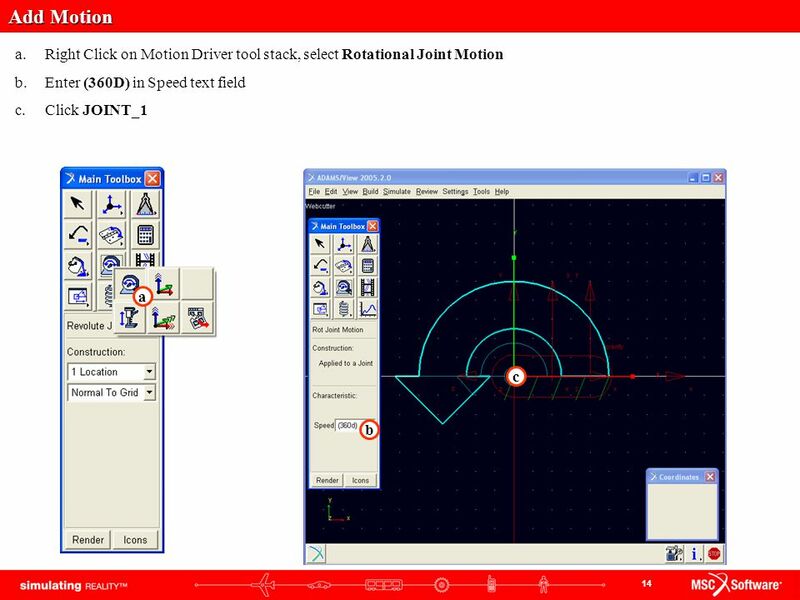 ADAMS checks for error conditions such as misaligned joints, unconstrained parts, or massless parts in dynamic systems, and alerts you to other possible problems in the model. 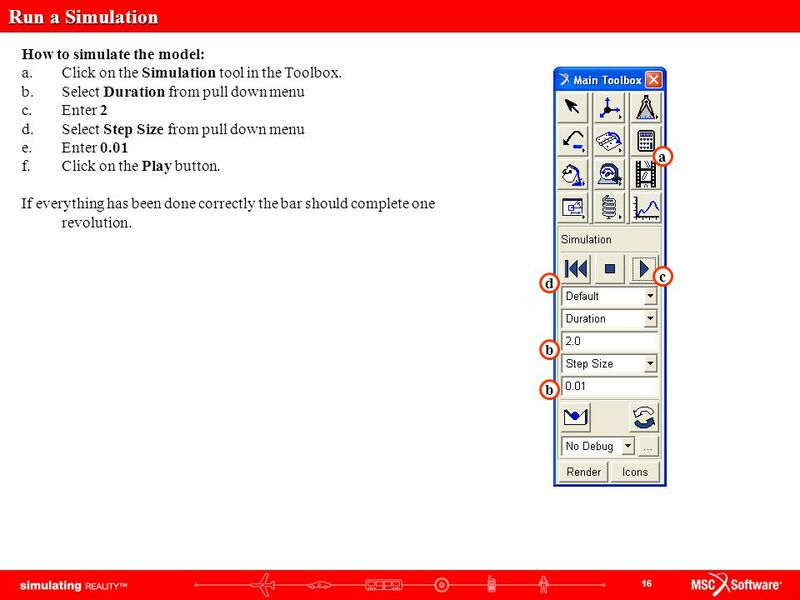 25 Save Assembled Model To join these location click Simulate  Interactive Controls Click which performs initial conditions solution. Ignore and Close the warning that comes up. 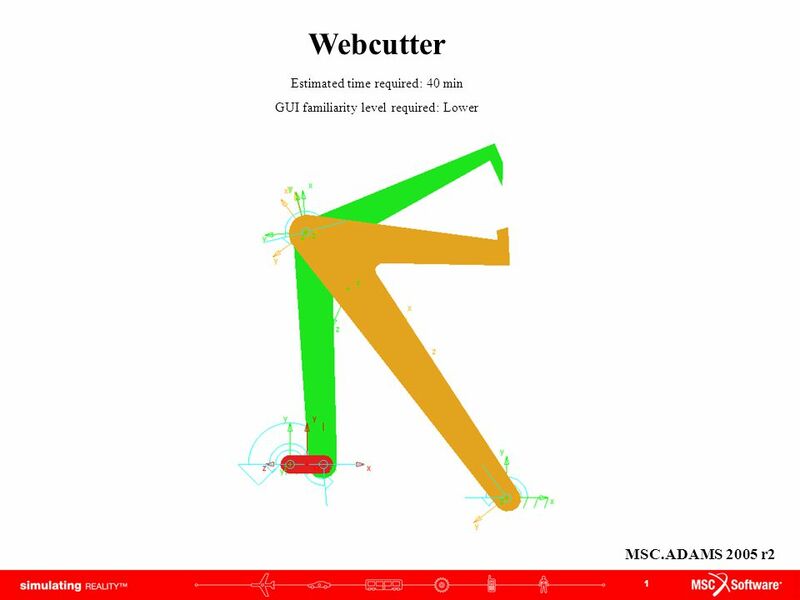 The part is now joined Click Enter .Webcutter_Asm in New Model text field, Click OK Click play to run the simulation. 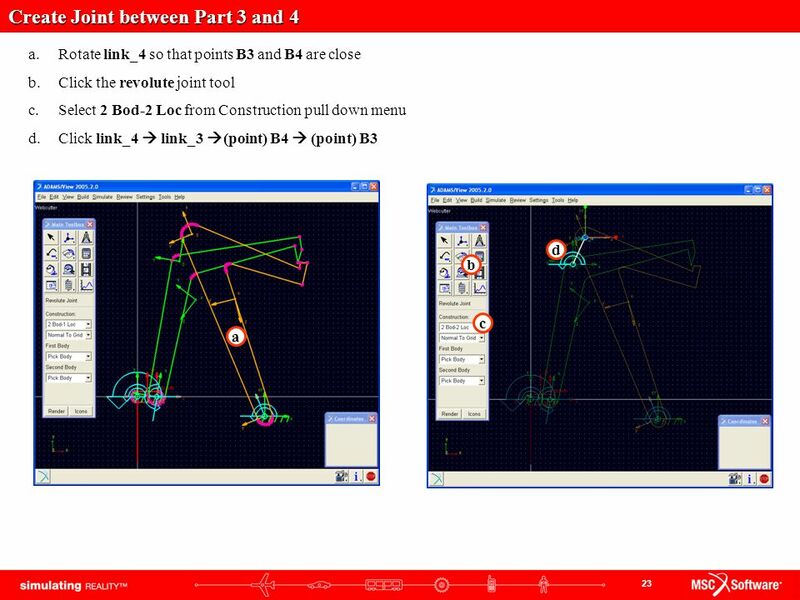 a f e b d Note: The warning is stating that the two reference points of the revolute joint are not the same and need to be the same for the part to run. 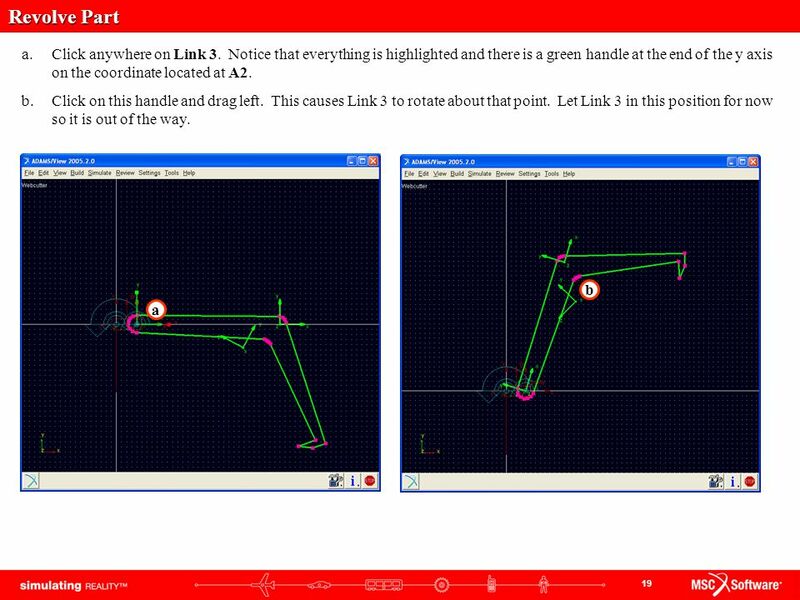 ADAMS will move the two links so that the points will coincide before running the simulation. 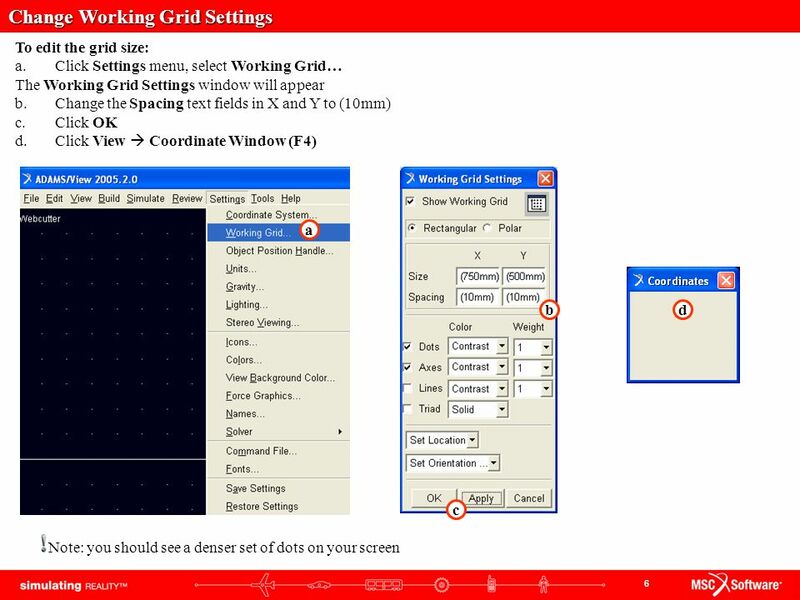 Right-Click link 2, Select Part: link_2  Modify Enter .Webcutter_Asm.Al6063 in Material Type text field Click OK Repeat this step for link_3 and link_4. 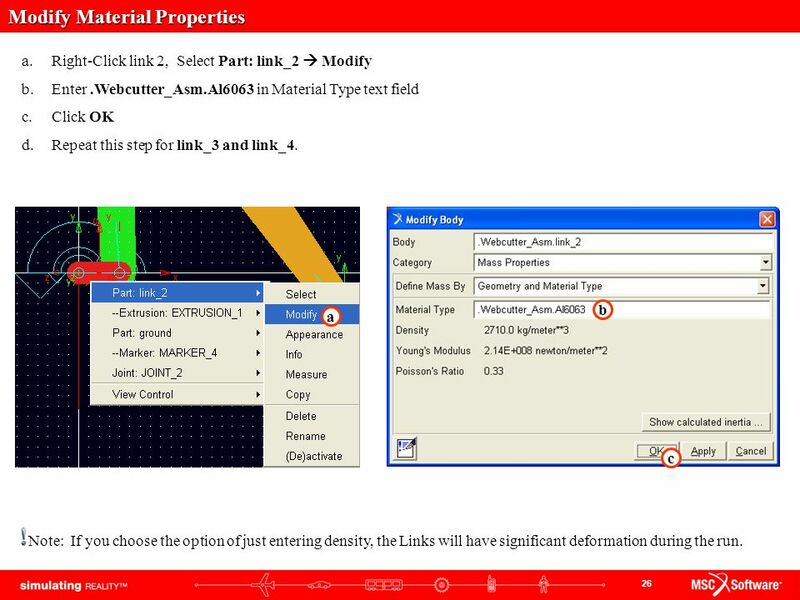 b a c Note: If you choose the option of just entering density, the Links will have significant deformation during the run. 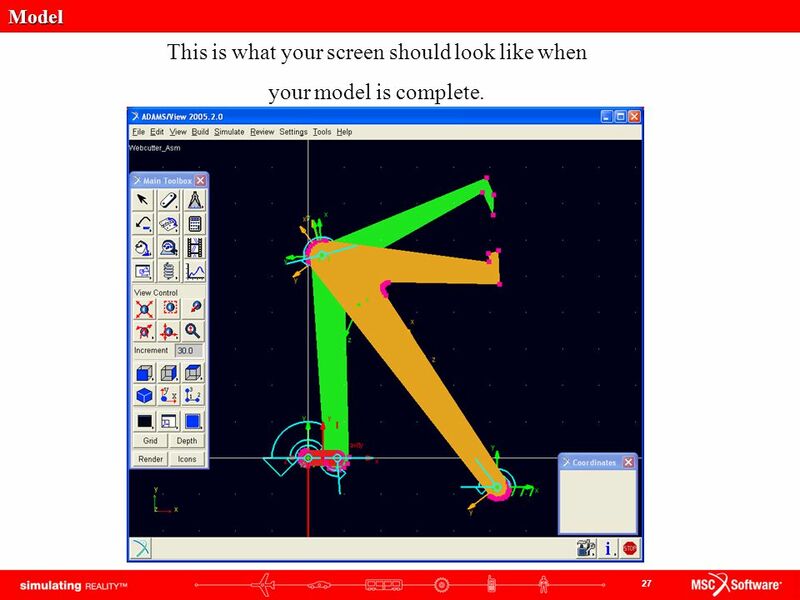 Model This is what your screen should look like when your model is complete. 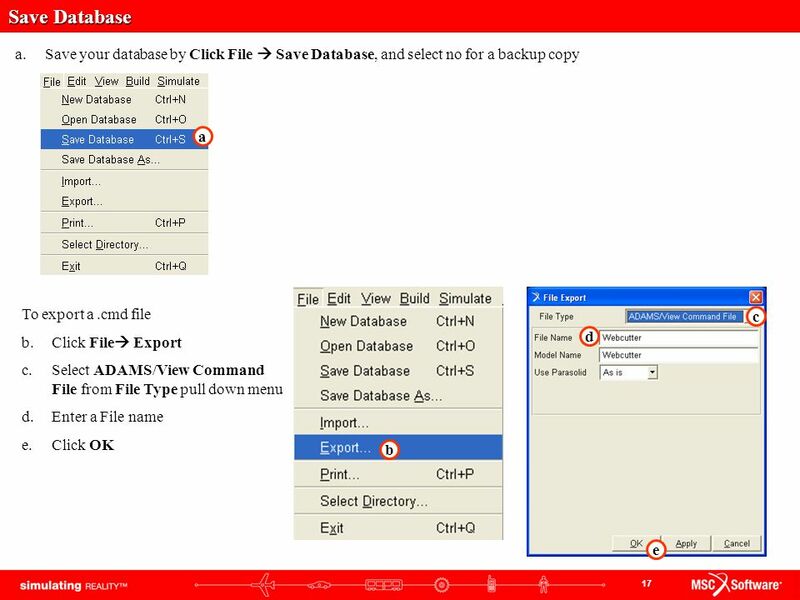 33 Export Data to Excel Click File  Export Table. 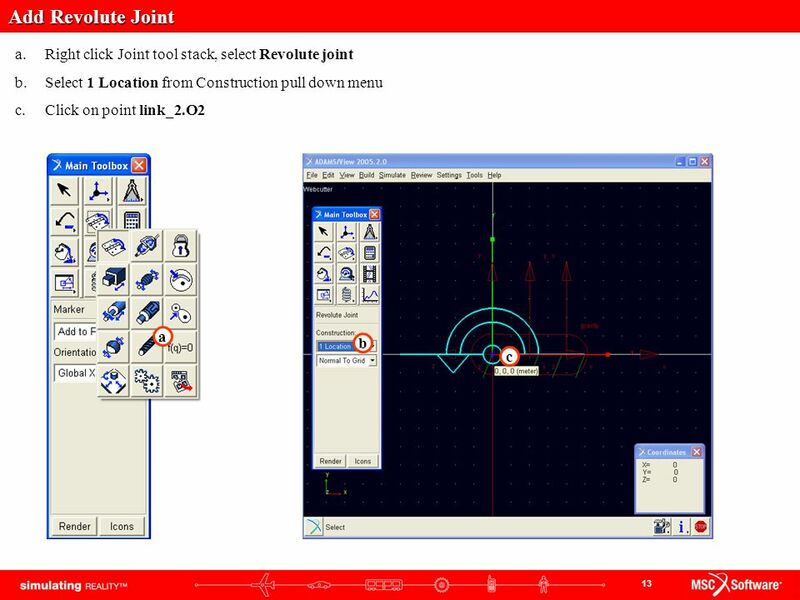 37 Best Practices Make sure the revolute joint is in the correct direction. 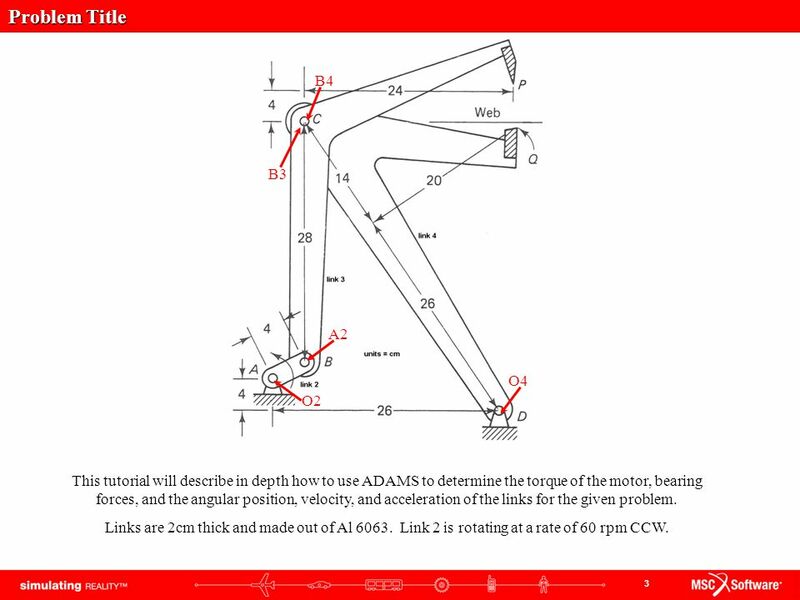 Check dimensions of your parts to make sure they are correct. 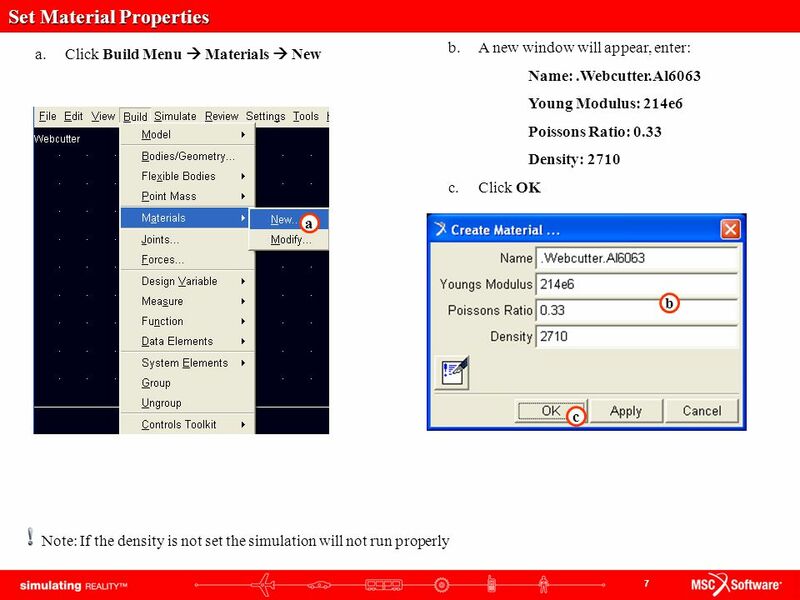 Check mass properties to make sure they are correct. 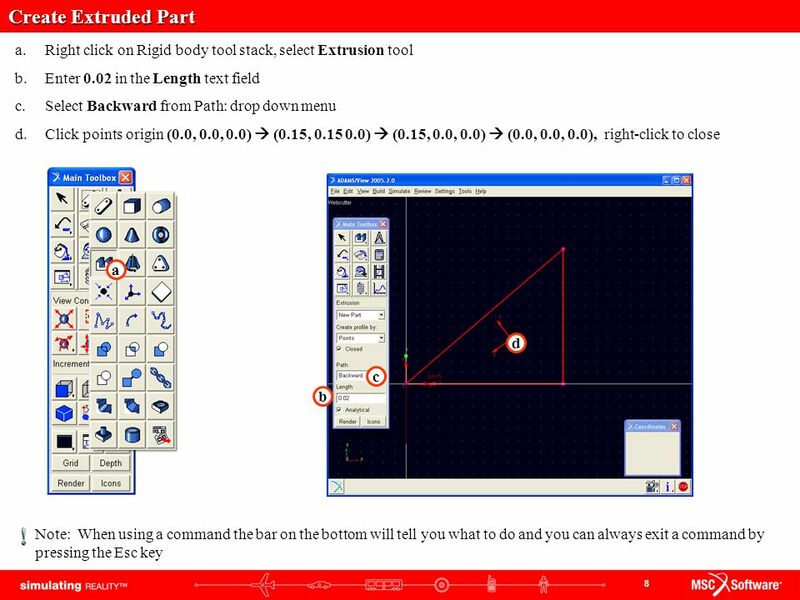 Check orientation of the part to make sure it is correct. 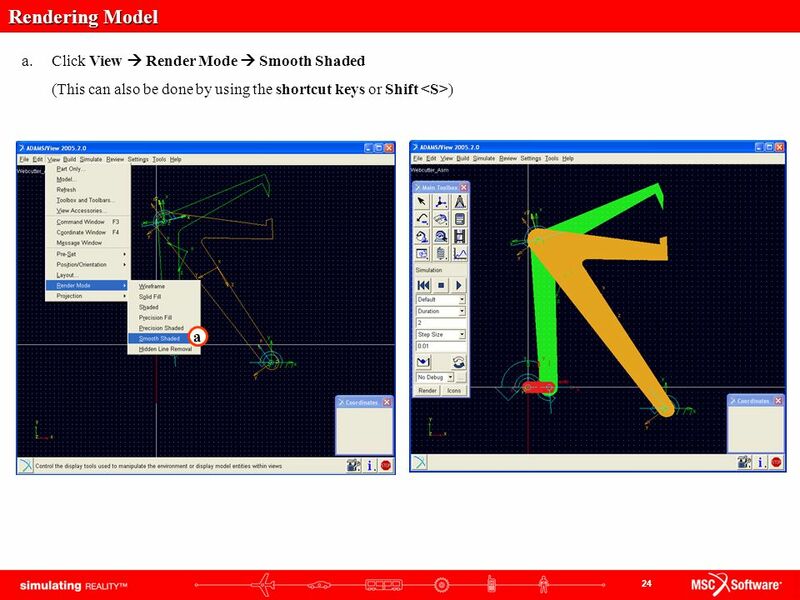 Make sure your model verification is successful Make sure the measures are set properly. 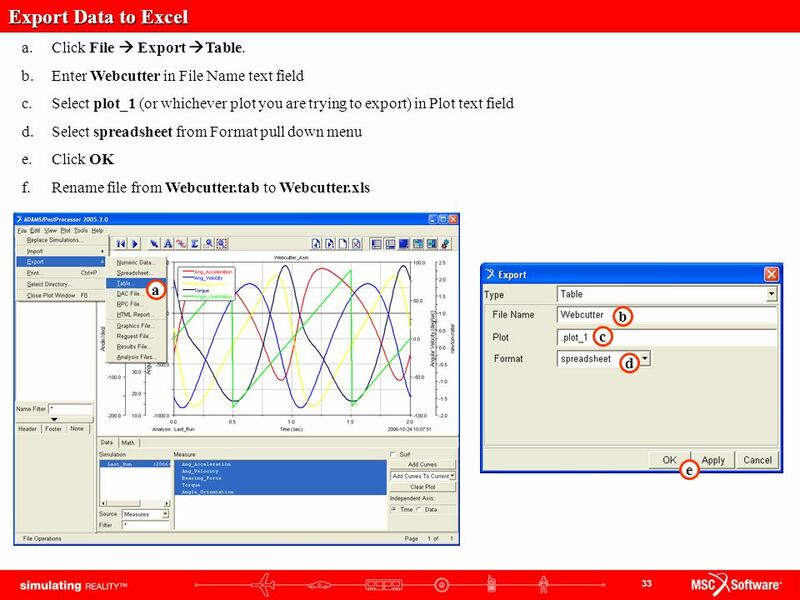 Make sure the plot is displaying the correct set of results. 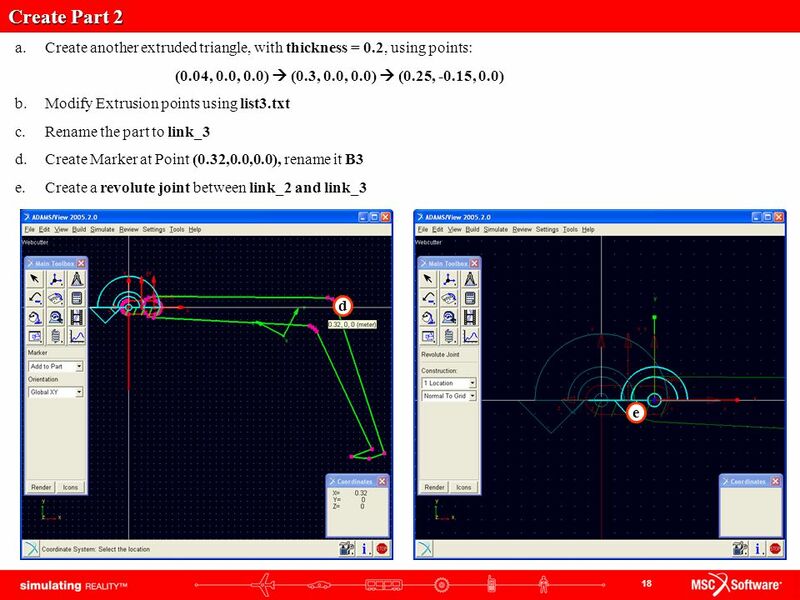 Download ppt "Webcutter Estimated time required: 40 min"
1 Helpful Notes 2005 Tutorial 1 : Game Pad. 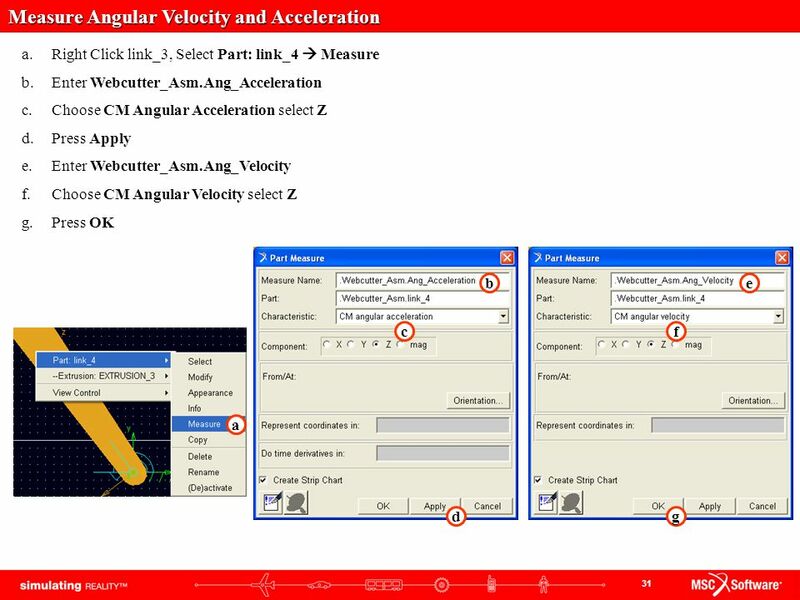 1 Four Bar Velocity Estimated time required: 15 min GUI familiarity level required: Higher MSC.ADAMS 2005 r2. 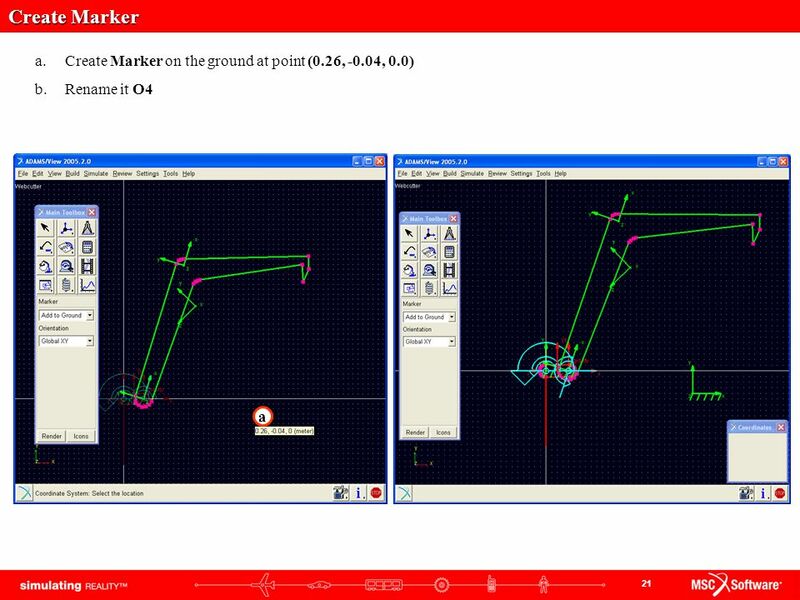 VND101, Workshop 06 WS06-1 MSC.visualNastran 4D Exercise Workbook Four Bar Linkage. 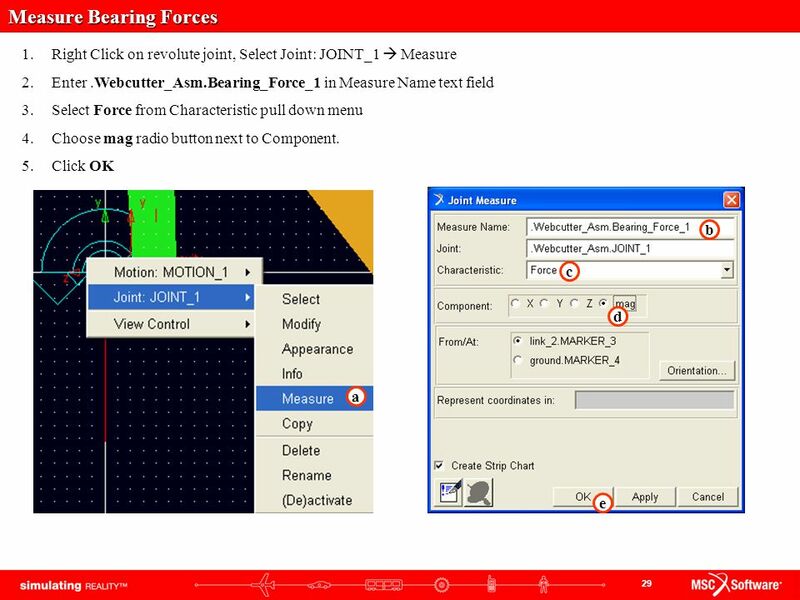 Integrating Access with the Web and with Other Programs. 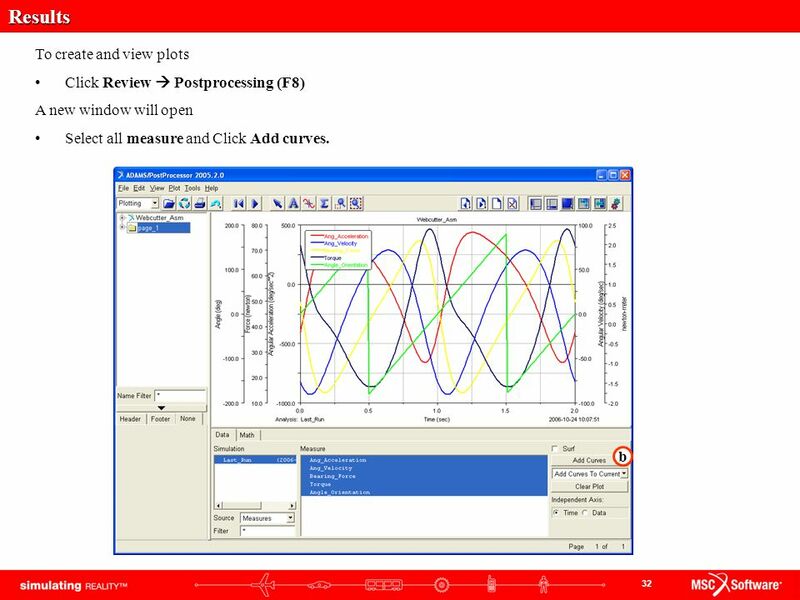 1 Impulsive Force GUI Familiarity Level Required: Lower Estimated Time Required: 20 minutes MSC.ADAMS 2005 r2. 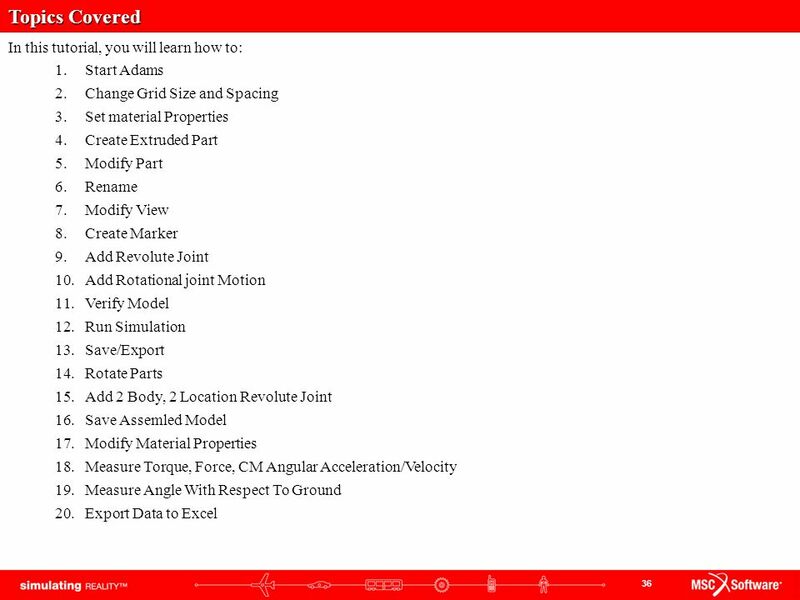 Power Point Presentation - Advanced Julia J. Stahl Distributed System Specialist.